60 inch flapper necklace made of black plastic beads. In the time of Gatsby and his lavish parties, women's style was just the Cats Meow! They were that perfect combination of fun and flippy, while still being just a little saucy with their short style. We would have loved to dance the Charleston with a handsome sailor. Maybe even rub elbows with some of Capone's men. (We don't condone the violence, but the gangster style was so alluring.) Everyone had such flare and could talk a mile a minute! We really love all the accessories that went with a woman's outfit. The elaborately beaded headbands with a long poofy feather on the side. The fur coats, always draped off one shoulder. And the jewelry! Oh, the jewelry! (Our absolute favorite part!) The glitzy rings and bangle bracelets, and the layers and layers of long necklaces! All of it jingling and tinking when you walked. Just slip into that fun-flippy dress, faux fur coat and layer on the rings and a couple Flapper Bead necklaces. You'll be the Cats Meow at any Roaring 20s party, and you never know who you'll run into at Gatsby's house! This necklace was super nice and looked great with my flapper costume! I would definitely recommend them! Worked fine, held up well. 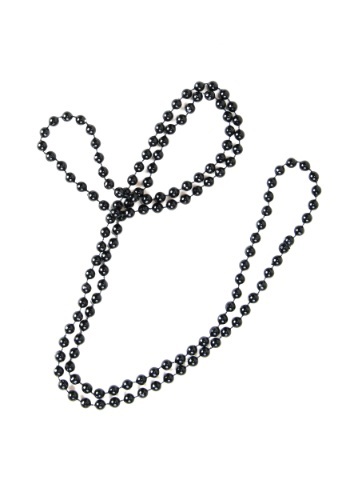 These are just plain black beads. They looked more shimmery in the picture.